TORONTO, ONTARIO--(Marketwired - Dec. 14, 2016) - New poll results today from Express Employment Professionals reveal how employers feel about annual employee reviews, a common practice among many large and small companies. In a recent poll of business leaders, more than half (52 per cent) say annual reviews are still relevant, but should be ongoing throughout the year. Another 20 per cent say employee reviews have little effect, good or bad, on a worker's performance, with 16 per cent saying a formal annual review is still an integral part of a successful management strategy. Six per cent believe annual employee reviews are not relevant and actually do more harm to worker productivity than good. 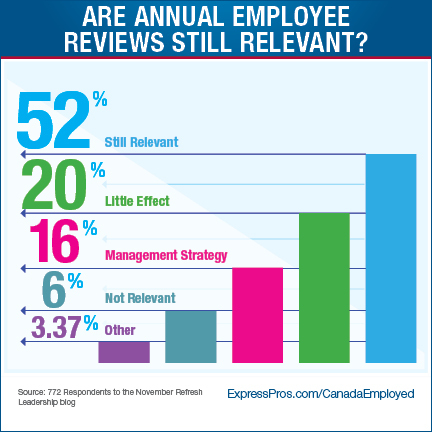 "Whether the review happens at the end of the calendar year or at some other point, it's clear that a majority of business leaders still believe annual employee reviews are effective, as long as their work are being evaluated throughout the year," said Bob Funk, CEO of Express. "Leaders should view annual reviews as an opportunity to review what went well for the employee, what can be improved upon, and discuss goals for the coming year. "The review becomes ineffective when it's a once a year meeting that isn't engaged throughout the year between the employee and their leader. Business leaders: don't miss out on this chance to improve your team through ongoing interaction about their professional goals," Funk said. The poll on the Refresh Leadership blog received 772 responses. Robert A. "Bob" Funk is chairman and chief executive officer of Express Employment Professionals. Headquartered in Oklahoma City, the international staffing company has franchises in the U.S., Canada and South Africa. Under his leadership, Express has put more than 6 million people to work worldwide. Funk served as the Chairman of the Federal Reserve Bank of Kansas City and was also the Chairman of the Conference of Chairmen of the Federal Reserve. Express Employment Professionals puts people to work. It generated $3.02 billion in sales and employed a record 500,002 people in 2015. Its long-term goal is to put a million people to work annually. Express launched in Canada in July 1996, with a franchise in London, Ontario, and since then, has expanded and grown across Canada significantly. There are currently 37 Express franchises in Canada-six in British Columbia, five in Alberta, two in Saskatchewan, 23 in Ontario and one in Nova Scotia.